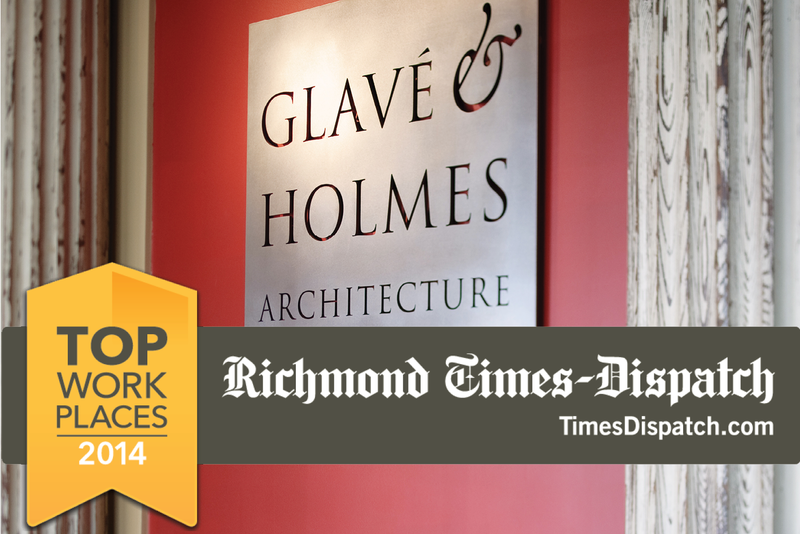 Glavé & Holmes Architecture is honored to be recognized as a 2013 Top Workplace by the Richmond Times-Dispatch and WorkplaceDynamics. The Top Workplaces program was set-up to recognize companies that have a great work environment, with results based solely on employee feedback. The employee survey is conducted by WorkplaceDynamics, a leading research firm on organizational health and employee engagement. WorkplaceDynamics looked at many factors, including employee engagement, encouragement of community involvement, and work/life balance. Glavé & Holmes had a 96 percent response rate to the survey. According to feedback from the survey, our employees believe that the G&HA operates by strong values and ethics. They also feel that the firm is going in the right direction and have confidence in the leaders. Glavé & Holmes was one of 50 companies in the Richmond area to make the list. Richmond SHRM, a chapter of the national Society for Human Resource Management, honored all 50 of Richmond’s Top Workplaces at the Sterling Workplace Awards event. The Richmond Times-Dispatch published the complete list of Top Workplaces. For more information about the Top Workplaces, please visit www.timesdispatch.com/special-section/top-work-places.